In a planetarium the visitors are, lying in reclining chairs, inside a projection dome on which astronomical shows are projected. Cozmix is the visitor centre of the Public Observatory Beisbroek (Bruges). A visit to Cozmix is a real thrill where individual visitors and groups are welcomed. You can admire the sky by day and by night. With our telescopes you can discover the moon, the planets, spectacular nebulae and distant galaxies. 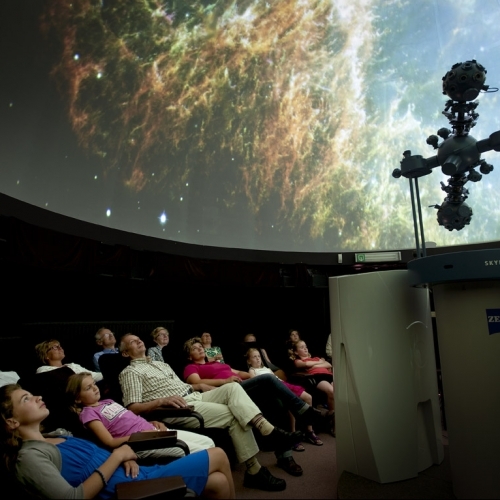 On our dome shaped projection screen in the planetarium, not only the stars and constellations are shown, but also the most spectacular video shows accompanied by appropriate music are projected with the full dome video system. Resulting in a unique audio visual sensation. Fly with us over the surface of Mars, and through the rings of Saturn ! Learn more about planets beyond our own solar system and eventual life in the universe.